When it comes to feeling confident and comfortable in our own skin—we know it can be … well, hard! Between finding the right clothes that fit and discovering our personal style, getting dressed can feel a chore, rather than fun. Even for our favorite fashion bloggers—who make getting dressed look effortless and amazing. 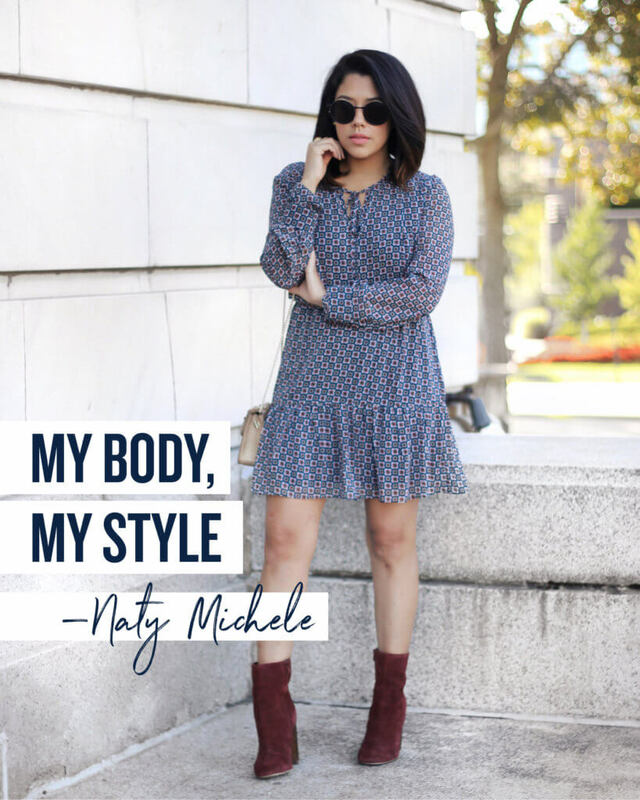 Keep reading to see how through experimentation, patience and some moments of style clarity, Naty of Naty Michele learned to find what was right for her. I’m petite and curvy. I’ve definitely gotten curve as I’ve gotten older. It seems each year my hips get a little wider and wider, which I have to admit was an adjustment for me, especially when it comes to finding clothes with the right fit. Trial and error. I’ve learned that there are some pieces I absolutely love on a hanger, but when I try them on they don’t work for me. For example, I love things with an oversized fit, but I have to be careful that they don’t overwhelm my petite frame. If you’re petite and curvy like me, I think the key is styling pieces in a way that can either help give the appearance of longer legs or a longer torso. Whenever I wear a midi dress, I prefer to style it with a classic pair of pumps. I love ankle strap shoes, but sometimes pairing these with a midi can make me look even shorter than I am. I think there’s this misconception that petite girls can’t wear longer length pieces, but you totally can it’s just all about you style them. For more petite styling tips, check out Naty Michele’s blog here.